Shooting engagement photos at sunset can make for a very dramatic signature shot! Here is the story behind this epic picture. A good idea is a good idea. While we often credit the Author of an idea, affording that credit can also be given to someone who also recognizes it. 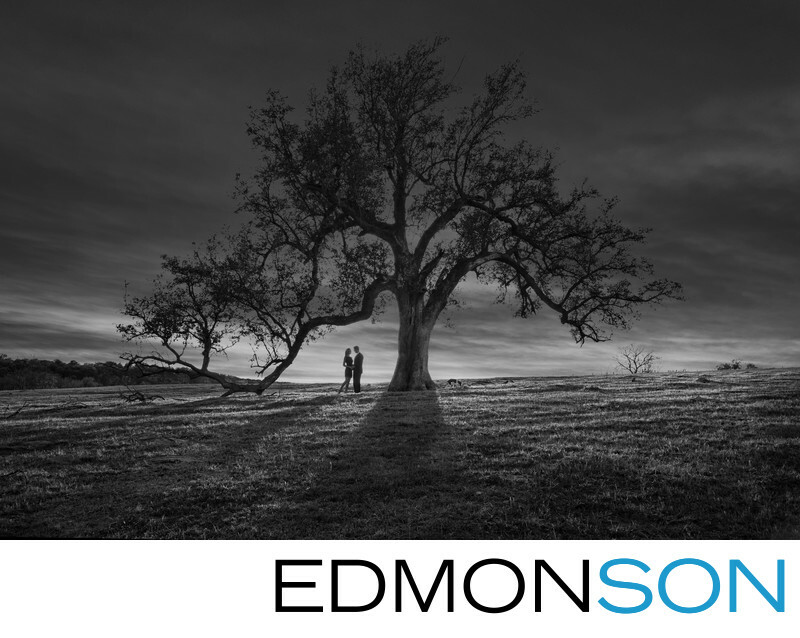 Most of the time, if an engaged couple were to suggest taking a picture of them and a tree, the natural shape and size will limit the potential for artistry and impact. In this case, the bride is the daughter of a furniture designer who sells to chic New York patrons. Because of her high visual I.Q., when she suggested we take a picture of her with a tree we knew that her background lent itself to understanding the unique qualities and shape that would be needed to make that photo visually pleasing. By timing our arrival to coincide with sunset, the compositional aspects were very straightforward to implement. Using the natural structure of the striking Live Oak typical of ranches in the state of Texas, we recognized that the branch extending to the ground suggested the partial shape of a heart, thus the perfect frame for this couple. Some minor posing refinements to provide some separation between the two individuals’ upper bodies allowed us to capture her feminine figure in a flattering manner. The addition of their puppy playing close by and to the right of the trunk provided a personal element to this engagement photo. In total, we captured about 5 frames before we moved on to the next shot. Inexperienced wedding photographers will often overshoot in situations like this unusual setting to cover themselves. Experience teaches you how to pre-visualize before you click the shutter and recognize that once you've got the shot, you can move on. The bride hired DFW Events to help plan her rustic wedding at Rough Creek Lodge which has a similar feeling to her ranch.